Post is another one of the CDs I’ve stacked up as potential record club choices over the last few months; sans theme, and with the gut feeling that we’d pretty grossly underrepresented music by women at our meetings, it jumped to the top of the pile. I bought Post in late 1995 from Woolworths in Dawlish, after being wowed by It’s Oh So Quiet (both the song and the extraordinary Spike Jones video). 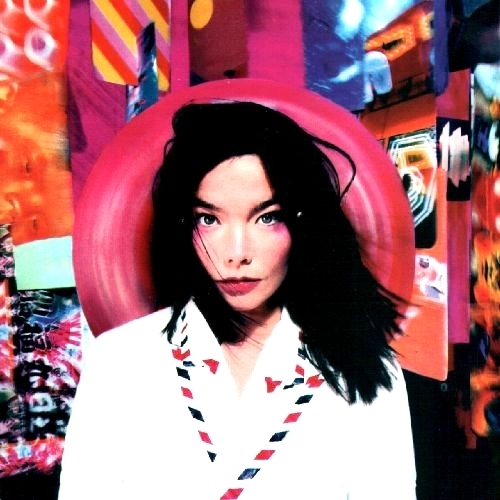 At the time it was the first album I’d bought by a female solo artist; the first, in fact, not by a band of boys with guitars – Screamadelica was the only record already in my possession that did anything other than play straight rock songs, pretty much. I was mocked for buying Post by some friends, for stepping outside the horizons limited by the Smashing Pumpkins, Stone Roses, and Pearl Jam that seemed to make up their tastes. Apparently, Post is (lyrically) about moving to London from Iceland, and the combination of excitement and apprehension that this inspired in Björk. Musically, it’s about… everything, almost, from the irresistible, semi-industrial groove of opener Army Of Me (written to admonish her younger brother, supposedly), the beatific techno-love-song of Hyper-Ballad, the big band theatricality of It’s Oh So Quiet, the luscious, modern fairy-tale of Isobel, the grinding trip-hop of Enjoy; there are so many textures, ideas, approaches, and emotions to take in. I feel like I’m still getting to know it all these years later. I have a strange relationship with Björk; I respect her immensely, and love a whole great big chunk of her music (especially Debut, Post and Homogenic) but she’s not someone I listen to all that regularly – I never turn to her music as default listening for some reason, and, looking on my iPhone, there aren’t many songs by her in my most-used playlists. So I’m resolving to use the choice of Post at DRC as a catalyst to spend some more time with her music over the next few weeks. Who’s going to recommend my good b-sides? Rob listened: I think ‘Post’ is one of the best records ever made. I don’t think there’s anything more I can usefully say. Perhaps I could add that i’d like to be locked in a box with the high-end sounds from Hyperballad for about 30 years, but you probably wouldn’t understand. Nick: Thanks a million for bringing this. I have quite a few b-sides and remixes from the Debut/Post era. I’ll try to dig them out if you’re interested. Tom Listened: I really admire Bjork. She’s a true visionary, a singular artist, one who is undoubtedly making the music she feels with scant regard to her record buying public – like all the best recording artists over the years. And I admire her music too – she is incredibly creative, original, technically skillful and imaginative. The trouble is I just don’t connect with it – there is no emotional hook for me and I can find her voice hard to take in large doses. I was really interested to hear Post. It was always the Bjork album I most wanted to check out. I’m glad I’ve now heard it in full and it was, in many ways, a remarkable listen. But, for me, it lacked memorable melodies and a rawness that I am often drawn to in music (and which I found in abundance on The Sugarcubes’ debut Life’s Too Good). So I guess I will continue to admire Bjork from afar rather than up close for the time being. Graham listened: Strangely I had completely forgotten that I already owned this album. As soon as it started I was instantly reminded why I bought it, and how good it really was. It has so much depth and variation and is simply brilliant. Thanks to DRC, its back in the CD player in the car!